Incorporate gamification and engagement mechanics into your SharePoint site. "SharePoint", "Enterprise Gamification", "Employee Engagement"
RedCritter for SharePoint allows employees to surface their accomplishments. 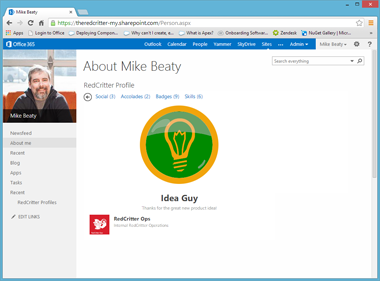 Embed badges, certs, skills, accolades and social links in your SharePoint profiles. 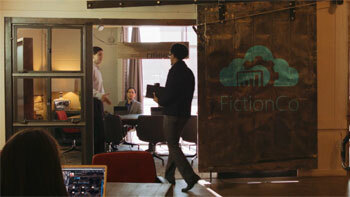 Run your own company rewards store and issue virtual currency based on actions users take in SharePoint. Allow employees to publish their accomplishments to their Yammer feed. See how RedCritter enhances SharePoint, Office 365, Outlook and Yammer. RedCritter enterprise gamification increases collaboration, powers expert searches and improves culture and team productivity. Finally you have the tools you need to increase, measure and manage employee engagement within SharePoint. With RedCritter users can be on-boarded more easily and fully engaged to ensure maximum productivity. Your developers can use our native SharePoint Designer Workflow Steps to easily award badges, certs, skill points and even virtual currency automatically based on actions within SharePoint. RedCritter enhances your SharePoint employee profiles, allowing your team to highlight their accomplishments and skills. Employees can give co-workers accolades directly from within their team member's profile. We also add badges, certs, skills and social links. With RedCritter you can search within SharePoint to find employees with specific skill levels, certs, badges and more. RedCritter makes locating experts and potential team members fast and accurate. With RedCritter you can easily create and manage a gift card or virtual rewards program for your company. 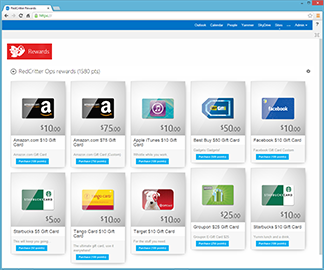 Your SharePoint site and other business systems can issue virtual currency, then as your employees earn points they can spend them on gift cards you approve for your rewards store. You set the value of your virtual currency. Insert our Feeds App part into your SharePoint pages and get a live, real-time view of RedCritter related activities as they occur. RedCritter Connecter developer APIs are compatible with SharePoint workflows. Simply call our REST style web services using the Http Web Service activity from any SharePoint workflow. Employees that receive regular individual recognition and rewards for doing good work are responsible for a 10% to 20% increase in revenue and productivity. RedCritter also works with your SharePoint Yammer feed. Employees can opt-in to publish their accomplishments in real-time to your feed.